The San Francisco Bay Area Council offers a wide variety of exciting camping programs for Tigers & Cub Scouts through Scouts BSA & Venturing. Most are held at our three fantastic camp properties: Camp Royaneh, Rancho Los Mochos Scout Camp, and Wente Scout Reservation. Remember, put the "Outing" in your Scouting! RLM is located in the scenic oak-studded hills of southeastern Alameda County, up a winding canyon road above the city of Livermore. This rustic ranch property is home to many adult-leader training courses, the SFBAC National Youth Leadership Training program (NYLT), a variety of Cub Scout wknd camping activities, and many area Scouts BSA Camporees. Rancho Los Mochos has several large campsite areas, making it ideal for unit camping and Troop, Pack or family camp outings. Campgrounds feature fire rings for ground fires (use may be restricted during high fire danger conditions), picnic tables and piped drinking water. CR is located nearby the historic lumber town of Cazadero, CA set among the majestic coastal redwood forests near the Russian River resort communities of Sonoma County. In addition to operating six weeks of Scouts BSA Summer camp, two weeks of Cub Scout Resident Adventure Camp, and one holiday weekend of Family Vacation Camp, Royaneh is available for unit use throughout the year. There are 13 cozy campsites with latrines, picnic tables, and piped drinking water. WSR is located in the rolling hills of Mendocino County outside of Willits, CA. This 2200-acre "Scout resort" has an 80-acre lake offering great opportunities for camping and the outdoor experience. In addition to operating seven weeks of Scouts BSA Summer camp, one week of Family Adventure Camp, three weekends of Family Vacation Camp, and the world-famous Tiger Cub Safari overnight program, Wente is available for unit use throughout the year. There are 14 large campsite areas with campfire rings, latrines, picnic tables, and drinking water. Being a Cub Scout is an adventure all its own! There are many new things to discover and explore. Being outside and learning about the world around you is an important part of the Cub Scout program and our Cub Camping programs provide the opportunity to do just that. Whether it's at one of our outstanding day camps or one of the weekend or week long camps, you are sure to have the most fun possible. Getting into the outdoors is what Scouts BSA is all about. Some of the best memories that Scouting provides are from weekend campouts or attending summer camp. We provide a number of exceptional camping opportunites for troops. There are specialty weekend events like Shooting Sports camps and summer camp at Camp Royaneh or Wente Scout Reservation for you to enjoy. No matter what your looking for we're sure you're going to have a lot of fun camping with the SFBAC Camp Staff! One of the most exciting parts of Venturing is the flexibilty the program provides. Your Crew can take the parts of Venturing that are most appealing and use those to plan your program. Our Ventruing camping program provides the same kind of flexibility. You can pick and choose the camping events that are right for your Crew and each event has room to adapt when you arrive. So if your ready to have some fun with Crews from all over Northern California, take a look at our programs and we'll see you at camp. The Scouts shouldn't have all the fun of going camping, and there is no reason the rest of the family can't get in on the adventure as well. The Family Camping programs have been developed for the whole family in mind. There are activities for all different ages and skill levels. If you are looking for a great time together with your family, then one of our wknd camps is just what you're looking for! Scout Camping isn't just a day-use or Summertime activity, it's something that goes on all year long! The camping facilities of the San Francisco Bay Area Council are available for your use through out the year, except during the winter closure period of November 1st thru February 15th. Call the Camping Department at (510) 577-9218 for information on how to reserve a campsite for your unit. For all those Scouts 16 years and older: Camp Staff interviews are held every year on the first Saturday in January and February. Click here to sign up for an interview time now! For all those 14-15 year-old Scouts, are you are interested in being a Counselor-in-Training (CiT)? Click Here to sign-up for an interview slot on the first Saturday in March! Fill out a summer camp staff application and send it to our Council office. 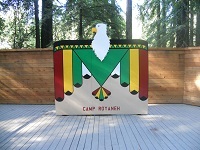 For more information contact our Camping Admin at 510-577-9218.